Divine Impacts | Is That A Stone In Your Hand? Is That A Stone In Your Hand? Posted January 19th, 2013 by Jeff & filed under Spiritual. It seems today we live in a society where everything and everyone is labeled. And the majority of us spend our every waking hour seeking the approval of those doing the labeling! That label so many of us strive for is that of acceptance; to be the best in the eyes of the world. Well what does that really mean to be the best? Or more importantly what does it really “take” to be the best? Society is telling us the answer to that is “whatever it takes”! No matter the cost; no matter the consequence; no matter the expense, do what you must to make it to the top! So there you have it; a society under the constant pressure to produce results or to end up being labeled and judged! 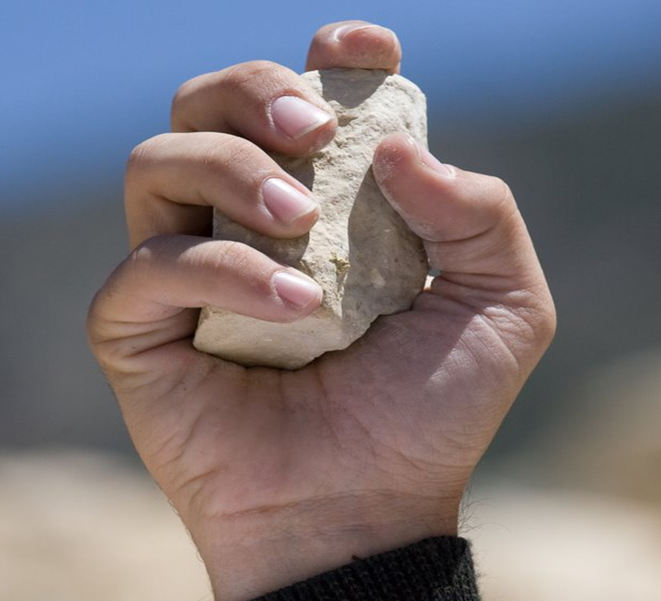 John 8:7 tell us “Let he who is without sin cast the first stone.” Yet in today’s society there are so many rocks flying around that we are all at risk of being hit! And who is it throwing the rocks? It is the media, our employers, our neighbors, our friends, our own families; it is I! We are all so afraid of not making it; of not being accepted; of being left behind that we despise seeing anyone else have success. So rather than applaud them for their achievements, we look from every angle to find that mistake they made, or that shortcut they took so that we can expose them for the fakes they are. It doesn’t matter that they did what they were told and went for it regardless; it was how they did it! Well nowhere along the journey was the HOW of it ever explained; nor was the HOW of it ever made to be important. It didn’t matter; until after the fact; then the truth comes clear; that the HOW is the only thing that really matters. Somewhere as a society, we loss site of the journey and focused merely on the destination. But its the journey that defines the heart of a person. It is where our self-image is developed; it is where our belief in ourselves is strengthened. It is where we begin to appreciate and respect the means by which not only ourselves, but others progress through this journey called life. We don’t want to simply arrive at life but we should want to LIVE and EXPERIENCE life! But many of us are so afraid of failing and being judged that we never even try. This is a guaranteed failure for we can never reach the potential our Heavenly Father created for with trying. Instead of possibly having to dodge a few stones thrown by others, we arm ourselves with stones and begin tossing them at everyone else who is trying. This is not the example we should be setting for our children. Instead we need to teach them to become their absolute best focusing on their journey; for their journey and purpose is unique and special to them. To compare themselves and gauge their progress by that of others and to be afraid of what others may say is no way to live; in fact it is not living at all! If we have to dodge a few stones standing up for what we believe in and for chasing God’s will and purpose for our life then realize that it will be worth it. It will only hurt for a moment; but the pain of regret will last a life time. The exciting thing is if we are all on that same journey of becoming our personal best, embracing each day, each accomplishment as well as each failure, believing and knowing that we are moving towards our own unique self, then we don’t have time to pick up stones nor throw them! Let us each set down the stone in our own hand and begin setting an example of living a life of love, joy, peace and purpose! I couldn’t resist checking out your latest effort before turning in. I was inspired along similar lines from our last conversation. I really like what you have put together again. I like the two angles you took on the stone throwing: they may be thrown if you are doing wrong and they could still be thrown your way if you do right. Great stuff, keep it up! What a great post. It hit home. I had a stone thrown at me this week; of course it was anonymous so all I have been doing is trying to find out who threw it. What I need to do is go back to the first testament and “turn the other cheek.” I did nothing wrong and I need to move forward and let it go. Too many of us are constantly looking to bring others down. Can you imagine a society where we actually tried to lift each other up? Wouldn’t it be amazing! I understand your frustration with the commenting system as I myself often get overlooked. Instead of trying too hard on here I have focussed on craft groups to try and improve my readership. That seed has fallen on much more fertile soil. I enjoyed your post very much and have recently contemplated just how far mankind would have got without the need to fight or condemn. Thanks for the comment Janice….I could see it being very simple. If everyone just had a little compassion for other humans what a more civilized world we would live in! Thanks for sharing. What an awesome poem. I don’t think it could be said any better! Thanks so much for sharing that!